I recently showed a violin getting a breast patch. Here’s a shot of that same top, prepared for making a plaster cast. The top has been spot tacked to a sheet of plywood, then a sheet of very thin latex stretched over it to protect it. Next a dam is built around the outside, to contain the plaster. The next step after this photo is to cut a piece of hardware cloth (something that’s a bit like window screen of thicker wire with bigger holes) to the shape of the violin top. Plaster gets mixed and poured over the top. After it starts to thicken a bit, the hardware (wire) cloth is pushed down into the plaster a half-inch deep or so, to hold the plaster in one piece in case it breaks for some reason (something I have never seen happen by the way). Then a backing bed of wood is pressed into the plaster surface, for taking the pressure of clamps. In less than an hour the plaster will have hardened enough to separate it from the top, and then it has to dry and harden for a week or so before it can be used. A top cast has two main uses. One is as a perfectly–fit counterpart to clamp against when doing interior repairs. Examples are patches in the top, gluing new underedges to thicken an edge, or fitting a bass bar. 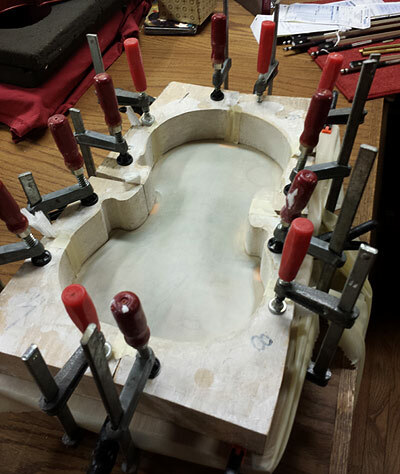 The other purpose is to reshape a distorted top: a cast is made, then corrected in small increments, clamping the top in under a warm, damp sandbag to reshape it through a series of tiny changes until the distortion is removed. This is a gradual, gentle process that can take several months. You’ll notice some bits of folded paper towel jammed between some of the separate piece of the form. You wouldn’t believe how thin of a hole wet plaster can slip through. As neatly as I try to work, usually some small part of the shop floor ends up with a fresh coat of whitewash.